All hail Cup Noodle instant ramen, the iconic styrofoam-packed snack (or sometimes meal) that’s sustained American college students, office temps and basement-dwelling gamer geeks since 1971! 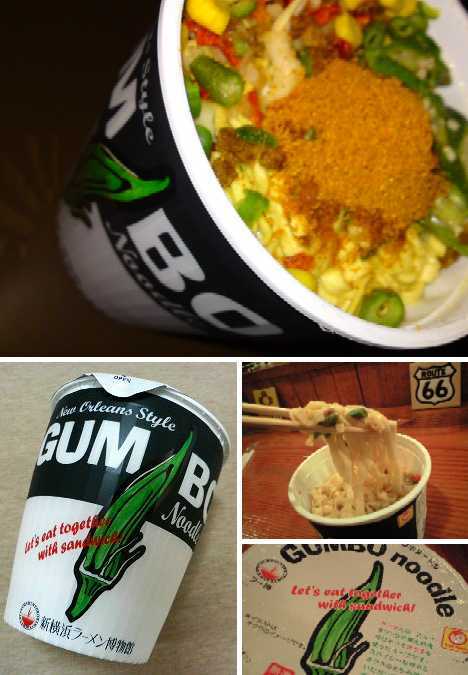 While most supermarkets and convenience stores stock the basic Chicken, Beef and Vegetable flavors, there’s a world of exotic, hypnotic and quixotic Cup Noodles out there that you can’t get here – even if you wanted to. Here are a dozen of the weirdest. Mmm, mmm good, or just good to go? Campbell’s Instant Noodle Chicken combines the best of both worlds – or at least the best of each hemisphere – in a single, lightweight cup. The result looks familiar yet foreign regardless of where you hail from. 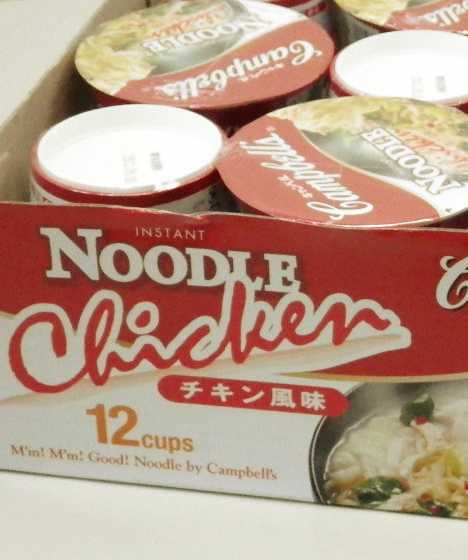 Campbell’s Instant Noodle Chicken came about as a collaborative venture between Campbell’s, Nissin Foods and Costco Japan, where the dehydrated delights have been sold by the case since last November. It’s anyone’s guess why Campbell’s hasn’t bolstered their domestic canned soup line with something the younger generation should eat right up. C’mon Campbell’s, where’s your can do spirit? Er, can don’t? 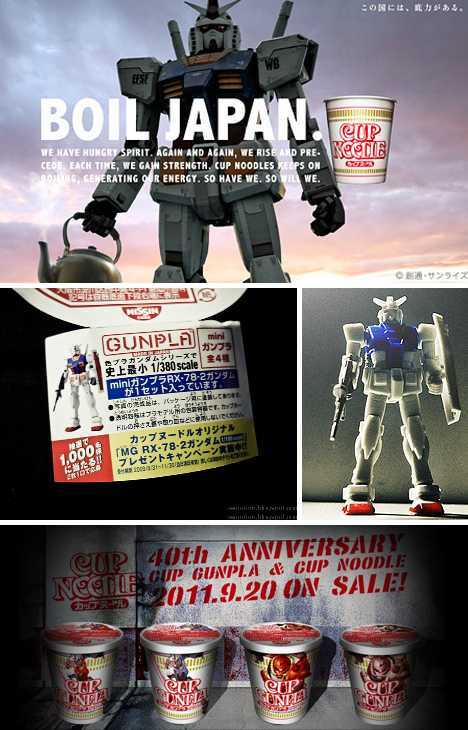 “Waiter, there’s a Gundam in my soup!” And so there should be, since Gundam and Nissin teamed up last September to celebrate Cup Noodle’s 40th anniversary. 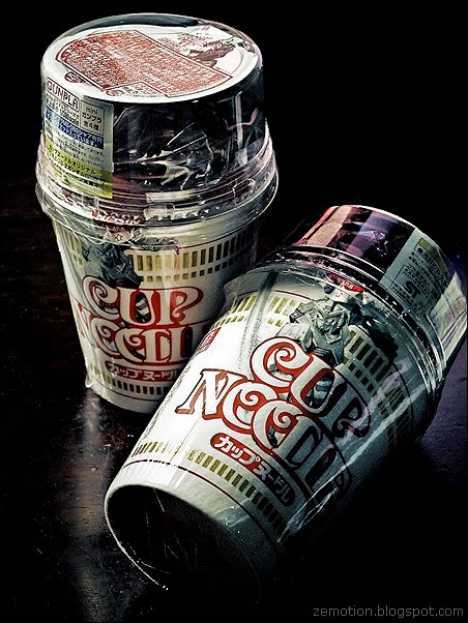 The limited time promotion featured 4 different “gunpla” (plastic snap-together Gundam models) housed in kit form and attached to the tops of individual Cup Noodle cups. For Gundam geeks who care about these things, and oh boy do they ever, the available models were Gundam RX78, ZAKU II, CHAR ZAKU II and the DOM. The models bore the distinction of being the smallest Gundam model kits ever made: 1/380 scale! “Vile weed!” C’mon Newman, you know the Germans always make good stuff but “Cup Nudeln Broccoli” sounds awful, even if it was deep fried in chocolate sauce, which it ain’t. Who could possibly appreciate broccoli-flavored ramen, besides your Mom providing she doesn’t have to eat it herself? Perhaps the name of the photographer who brings us the above image offers some clue… it’s CharlyManson. Any more questions? 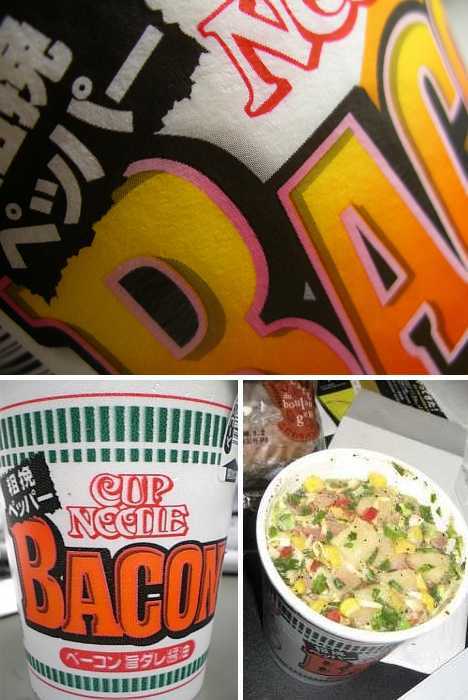 From Hell to Heaven in a styrofoam cup, it’s Bacon Ramen, y’all! Of course, dehydrated and re-hydrated bacon might not be the best way to enjoy the esteemed fruit of the noble swine but beggars can’t be choosers and one takes what life (or in this case, Nissin) doles out. 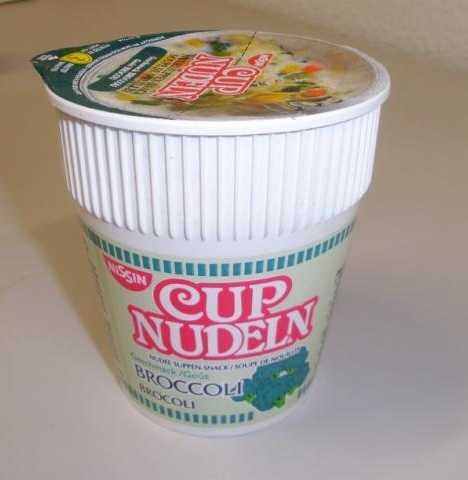 Besides, anything (and we do mean ANYTHING) has to be better than Cup Noodle Broccoli… Nudeln, whatever. 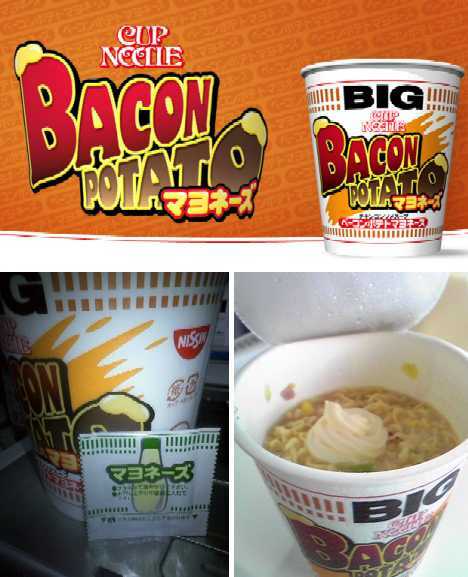 And for those who need more starch with their noodles, try BIG Cup Noodle Bacon Potato Mayonnaise… er, we could do without that last ingredient but Japanese are reluctant to hold the mayo no matter what. At least Nissin is nice enough to provide the mayonnaise in a separate packet that comes stuck to the top of the cup. Pour in the boiling water, wait 3 minutes, open the lid and squeeze out a dollop of ivory white joy… ohhh yeahhh! 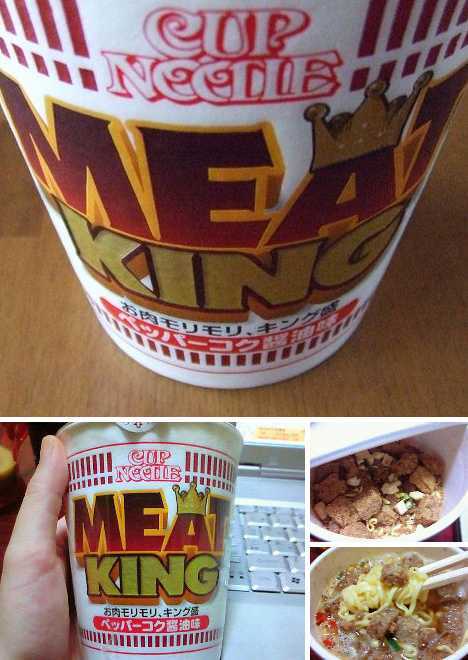 Pork may be the meat of kings but when it comes to big, meaty Cup Noodles the king is… Meat King! For just 170 yen (about $1.90) per cup you get a seriously heaping helping of beef cubes, diced chicken, and minced pork flavored with pepper and soy sauce. How serious, you ask? The 80 grams (2.82 oz) of meat outweighs the 60 grams (2.11 oz) of noodles. 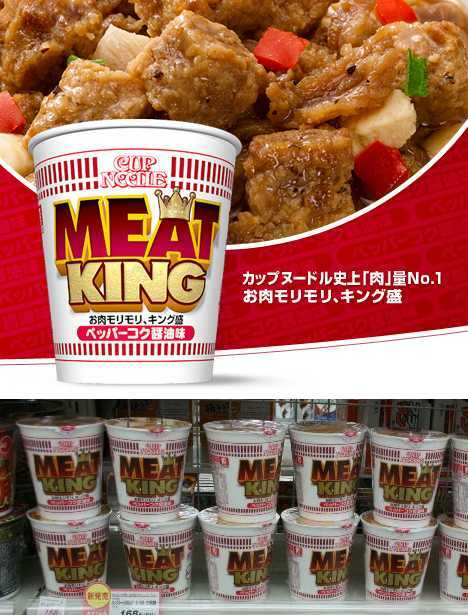 Meat King is one of several “BIG” Cup Noodles that take the erstwhile snack deep into the meal red zone. Curious that while the supersizing fast food trend is in retreat across the USA, in Japan it’s not only surviving but thriving. 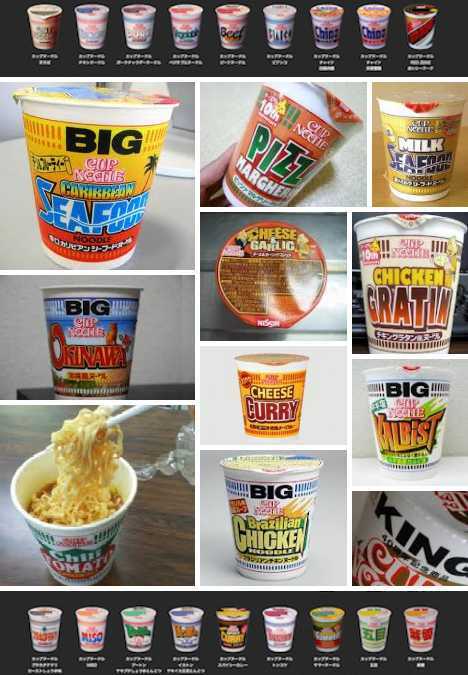 If your stereotypical fast-food fanatic geek-o-nerd could choose his ideal meal, it’d probably be Doritos Nacho Extreme Ramen or something like that… and lo & behold, the Ramen Gods (or Nissin, at least) were listening. How else to explain Cup Noodle Tacos? 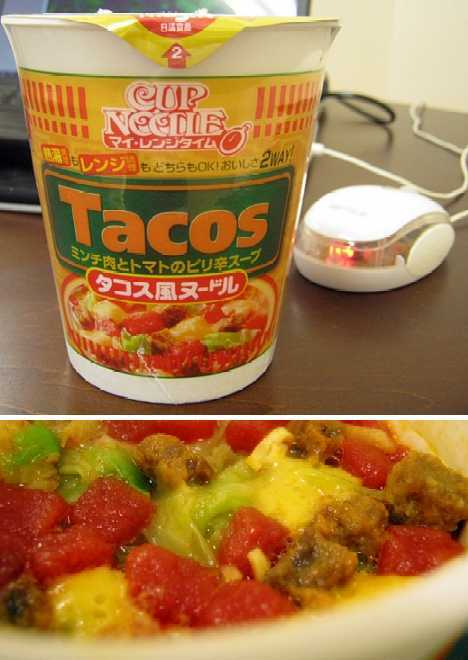 Cup Noodle Tacos includes beef, tomatoes, cabbage, onions, cheddar cheese and spices mixed to impart the aroma of tortillas. It can be prepared two ways as well: the usual “add boiling water and wait 3 minutes” procedure or just add water and pop the cup in the microwave. 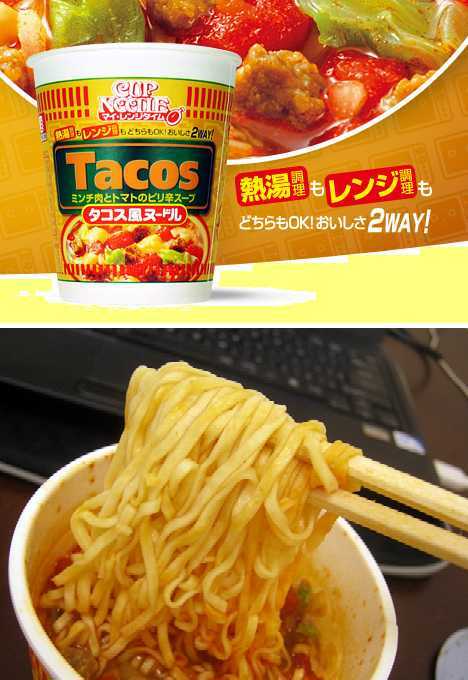 ¡Yo quiero Cup Noodle Tacos! “Let’s eat together with sandwich!”, goes the tag line for Maruchan’s New Orleans Style Gumbo Noodle… for reasons known only to the head honchos at Maruchan. 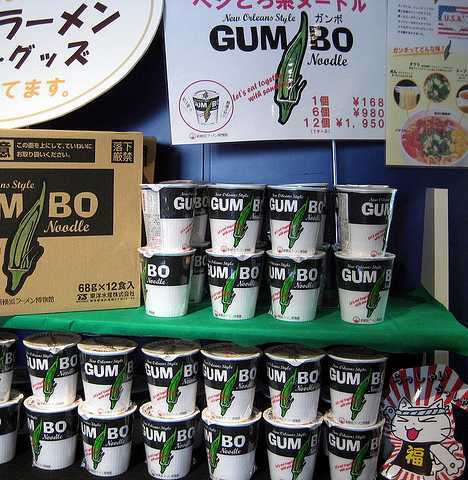 Though not an official Cup Noodle variety made by Nissin, Maruchan’s outrageous entry in the Ramen Wars stands out simply for being Louisiana Gumbo, made & sold only in Japan. New Orleans Style Gumbo Noodle features “spicy hotness” diffused through an Okra-based sauce and flat noodles. Not a speck of rice to be seen… dem Cajun’s, dey gonna be a’ragin’! 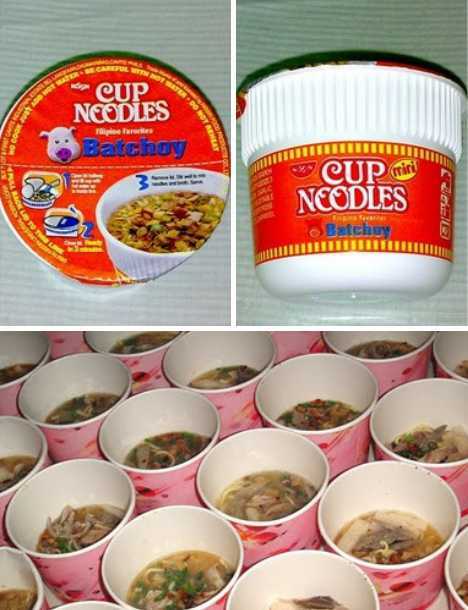 Batchoy is a Philippine specialty originating in Iloilo City that’s something like Haggis Soup. Typical ingredients include pork organs (liver, spleen, kidneys and heart) crushed pork cracklings, vegetables, shrimp, beef loin, shrimp broth, and chicken stock… now in a handy portable version! 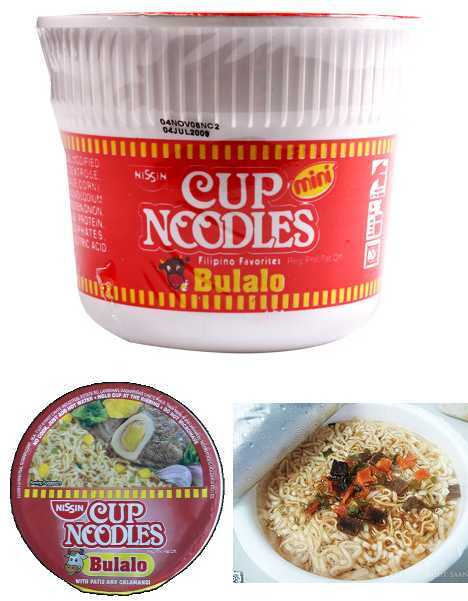 Until Nissin actually introduces Cup Noodle Haggis (and you know it won’t be long), you’ll have to be satisfied with Cup Noodle Batchoy or its kissin’ cousin, Cup Noodle Bulalo… that’s Beef Bone Marrow flavor to the uninformed by the way. 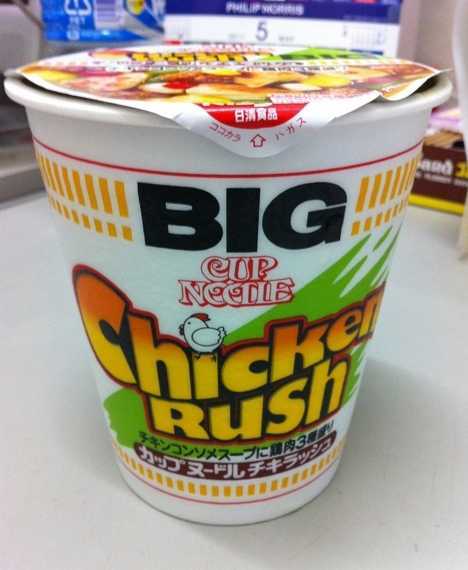 How big is BIG Cup Noodle Chicken Rush? When you open the lid, it echoes with the sounds of salesmen. Salesmen! Sorry, couldn’t resist – and it’s likely YOU won’t be able to resist this cloyingly complex concoction should you ever have the chance to try it; a circumstance that either requires you to be in Japan or have a friend there willing to mail some to you. 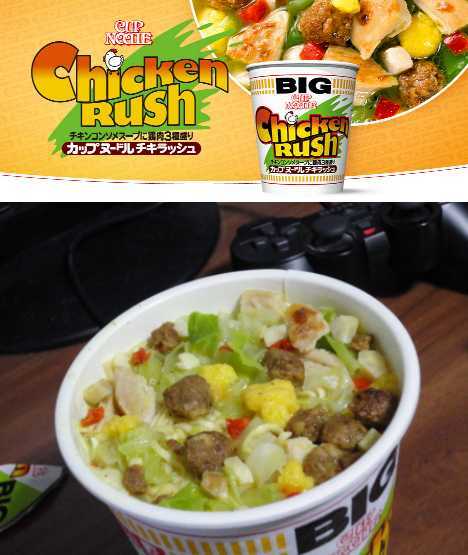 We’re not saying BIG Cup Noodle Chicken Rush is close to delicious, mind you, just closer to the heart… OK, enough RUSH refs, promise. Some of the key ingredients are music to any ramen-lover’s taste buds, however: cabbage, scrambled eggs and diced red bell peppers. If that doesn’t give you a Chicken Rush, what will? 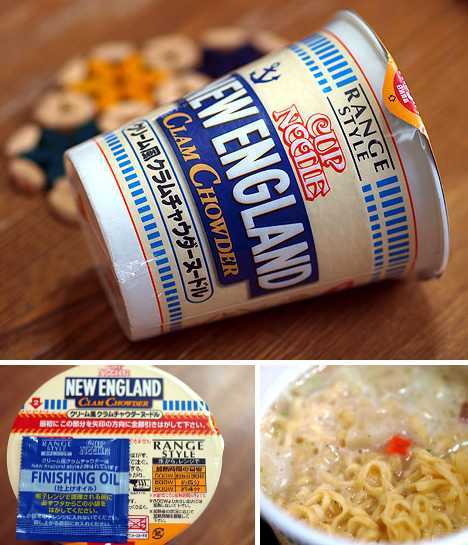 Of all the soups less likely to get the Cup Noodle treatment, Clam Chowder would surely top the list. 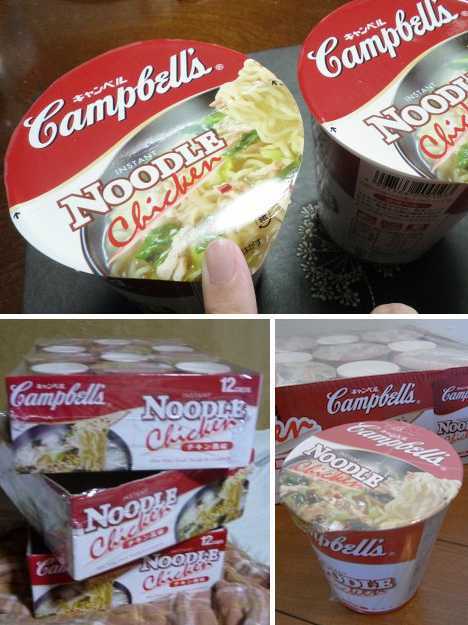 “Challenge accepted”, sez Nissin… is there anything those guys can’t whip up & dry out? Even better, this interesting tomato clam chowder soup is stated to be “Range Style”… do they use Free Range Clams or something? 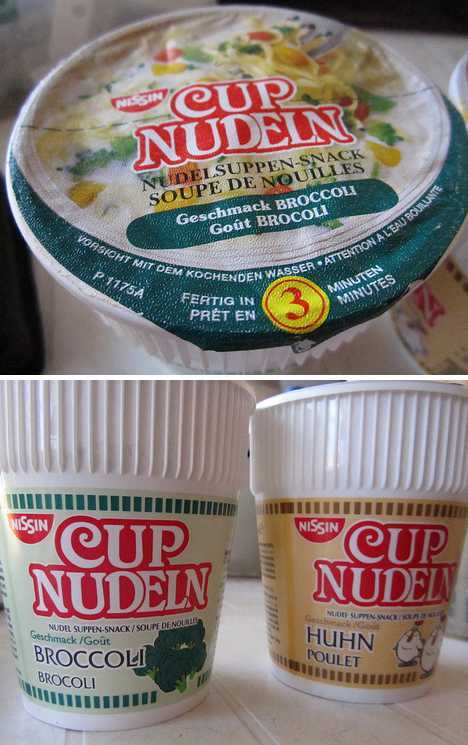 Maybe it’s just the latest entry in the ever-expanding Nissin Cup Noodle range of styles. 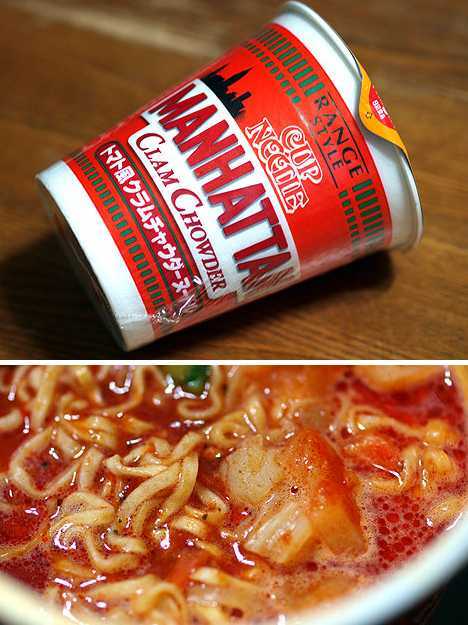 So you don’t like Manhattan Clam Chowder and prefer the New England variety? Even in Cup Noodle format?? No problem, Cup Noodle’s got you covered even if a steaming reconstituted cup might just get you permanently banned from Bahston Hahbuh. They say an army travels on its stomach, and that old maxim goes for an army of geeks, an Army of Darkness, or the Japanese Army. The latter, known since WW2 as the non-threatening-sounding SDF (“Self Defense Forces”) doesn’t get much choice in their military-issue Cup Noodles but they DO get them: in specially marked Soy Sauce and Seafood flavors. 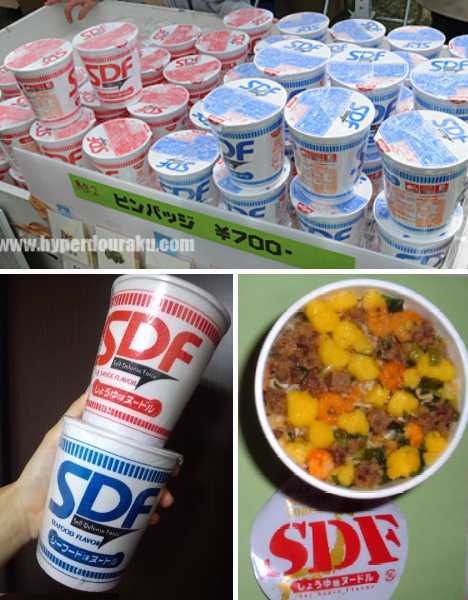 SDF Cup Noodle is sold through a number of domestic websites so you don’t have to enlist to enjoy. 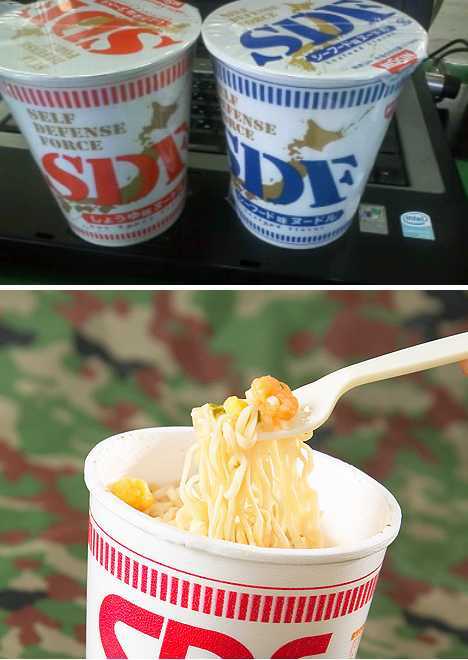 Honestly though, you’re not missing much if you miss it: side-by-side comparisons with their civilian Cup Noodle counterparts indicate the Japanese GIs are left holding the wet end of the noodle. It really seems like you can get Cup Noodle instant ramen in almost any flavor from wild to mild… actually, INCLUDING Wild and Mild! 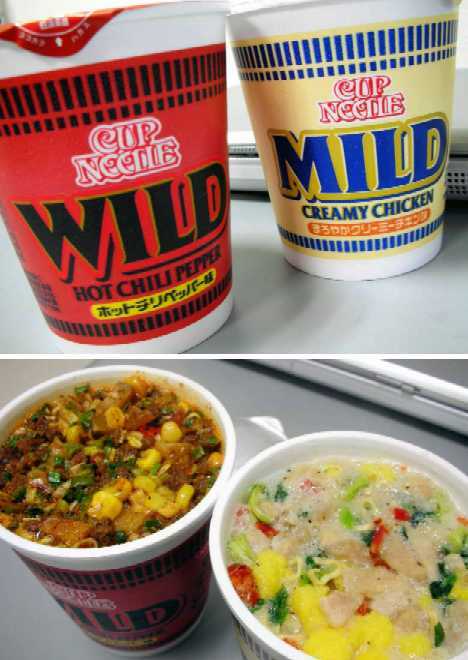 Yes indeed, Cup Noodle WILD Hot Chili Pepper and MILD Creamy Chicken are a match made in heaven, or hell, or more likely somewhere in between: such as the Cup Noodle test kitchen. Gotta hand it to Nissin, they’ll go to any extreme in order to satisfy their fan base. 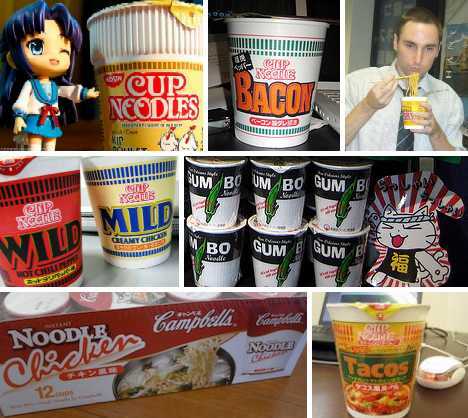 Had enough of Cup Noodle? Of course you haven’t, unless you’re some sort of geek jet setter who makes it his business to try every possible Cup Noodle flavor from Finland to Formosa and back again. We’ll just post the abridged smorgasbord above so you’ll see some of the other offbeat flavor savors we didn’t cover in depth. 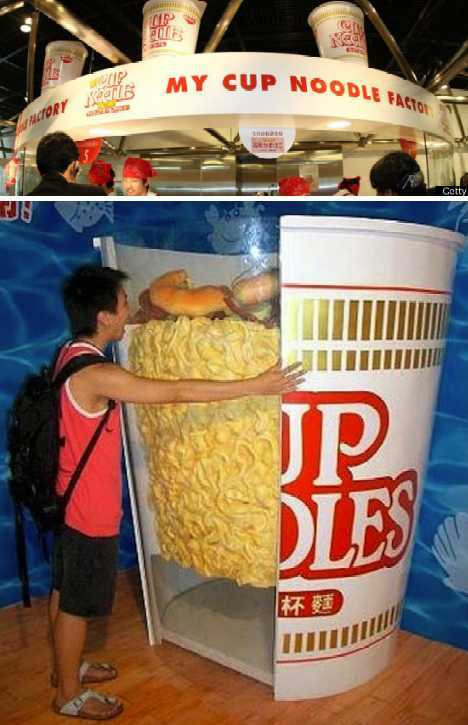 Cup Noodle connoisseurs should make it a point to visit the Cup Noodle Museum in Yokohama, Japan, where getting into hot water is a good thing! 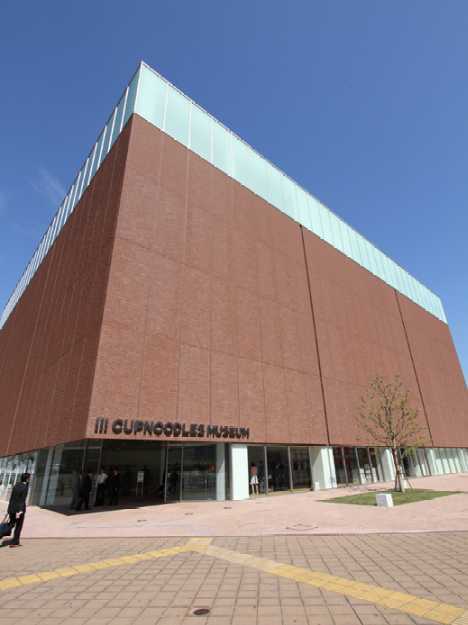 Opened in September of 2011 to coincide with Cup Noodle’s 40th anniversary, the museum offers snackers, slackers and undercover hackers a glimpse into the mind of Cup Noodles inventor, the late great Momofuku Ando. If you get hungry during your visit (and you know you will), pop into the on-site My Cup Noodle Factory where you can whip up your very own custom Cup Noodle with ingredients allowing for 5,460 flavor combinations. Ramen to that!